Air Handler The indoor component of your air conditioner or heating system that moves air throughout your home. AFUE Annual Fuel Utilization Efficiency. AFUE is a rating that reflects how efficiently a gas furnace converts fuel to energy. An AFUE of 90 means that approximately 90 percent of the fuel is utilized to provide warmth to your home, while the remaining 10 percent escapes as exhaust. BTU British Thermal Unit. In scientific terms, it represents the amount of energy required to raise one pound of water one degree Fahrenheit. One BTU is the equivalent of the heat given off by a single wooden kitchen match. For your home, it represents the measure of heat given off when fuel is burned for heating, or the measure of heat extracted from your home for cooling. CFM Cubic feet per minute, a standard of airflow measurement. A typical system produces 400 CFM per ton of air conditioning. Capacity The output or producing capability of a piece of cooling or heating equipment. Cooling and heating capacity are normally referred to in BTUs. Compressor The heart of an air conditioning or heat pump system. It is part of the outdoor unit that pumps refrigerant. The compressor maintains adequate pressure to cause refrigerant to flow in sufficient quantities in order to meet the cooling requirements of the system and your home. Condenser Coil or Outdoor Coil Located in the outdoor unit, the coil dissipates heat from the refrigerant, changing the refrigerant from vapor to liquid. In American Standard units, the coil is called Spine Fin. Energy Star A program developed by the Environmental Protection Agency (EPA) in order to reduce the nation's energy consumption. Energy Star® qualified heating equipment can be up to 15 percent more efficient than standard models. Energy Star-qualified cooling equipment can be up to 7 percent more efficient than minimum-standard equipment. Heat Pump Outdoor unit that warms your home in winter and cools your home in summer. HSPF Heating Seasonal Performance Factor. 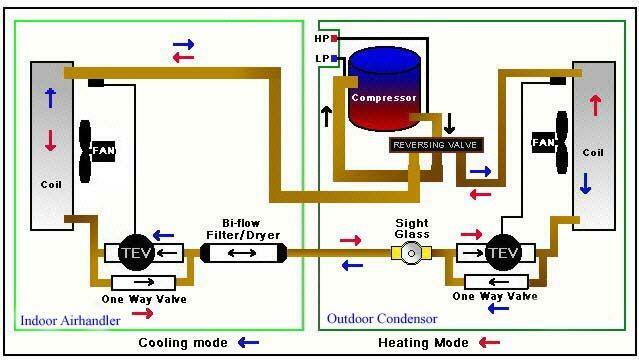 Refers to the efficiency of the heating mode of heat pumps over an entire heating season. The higher the number, the more efficient the unit. Heritage Hybrid™ comfort system A home comfort system that combines a Heritage® heat pump with a gas furnace. For areas with colder temperatures, combining electric heating (heat pump) with gas heating (furnace) lets you choose from two fuel sources in order to respond to fluctuations in utility costs. Humidifier A device that adds moisture to dry indoor air during wintertime and in hot, dry climates. Matched System A heating and cooling system where all of its components are matched in capacity and efficiency. This enables your system to perform at its best, and most efficient, for longer. SEER Seasonal Energy Efficiency Ratio, a rating that measures the cooling efficiency of a heat pump or air conditioner. The higher the number, the more efficient the unit. Split System (also Indoor/Outdoor System) Refers to a comfort system consisting of components in two locations. Common examples include an outside unit, such as an air conditioner, and an indoor unit, such as a furnace with a coil. Thermostat A temperature-control device, typically found on a wall inside the home. It consists of a series of sensors and relays that monitor and control the functions of a heating and cooling system. American Standard's programmable thermostats allow you to program different levels of comfort for different times of the day. Two-stage Heating / Two-stage Cooling Two-stage heating and cooling is considered to be more efficient, because it operates at a low, energy-saving speed most of the time. However, on days when more heating or cooling is required, it switches to the next stage for maximum comfort. Variable Speed Motor The fan motor inside higher efficiency indoor and outdoor units is designed to change its speed based on your home's heating and air conditioning requirements. Working in conjunction with your thermostat, it keeps the appropriate-temperature air (e.g., warm air on cold days) circulating throughout your home, reducing temperature variances. The variable speed motor also increases dehumidification and is quiet because it runs at a lower speed most of the time. Plus, the consistent air circulation eliminates noisy startups and shutdowns.